Vapestick refills ensure you can always keep your Vapestick XL E-Cigarette topped up with your favourite flavours. Offering value for money and a user-friendly design each Vapestick cartridge easily slides into place and once in, the cartomizer will provide around 30 cigarettes worth of satisfying vaping. Enjoy your Vapestick Original Tobacco Cartomizers in a choice of four nicotine levels: 0mg, 11mg, 18mg and 24mg. The rich and authentic tobacco flavour is more genuine than many of the other tobacco flavours on the market, with no plastic-tinged aftertaste or burnt flavour. UK brand Vapestick works hard to ensure their flavours closely match premium-brand cigarettes, without the tar. 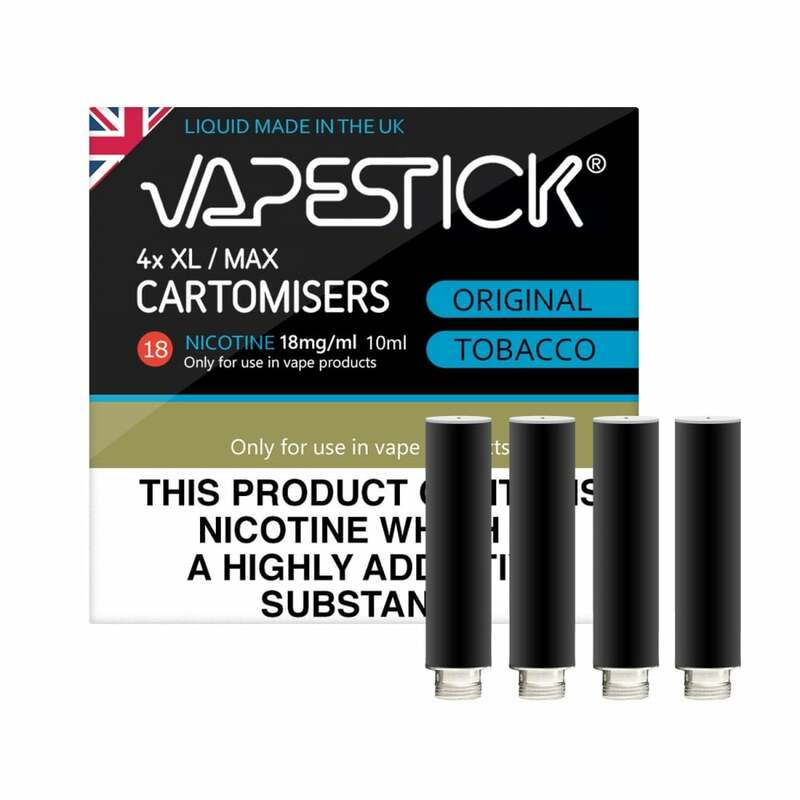 Vapestick Original Tobacco cartomizers are one of their most popular options, due to the authenticity in the flavour. I feel these are by far the best I have tried. Much better than having to fiddle around trying to use the liquid. Basically, charge up the battery, fit it to the cartomizer & you're ready to go! They last ages & don't give a weird aftertaste like the others I've tried. Also, I've found other vape products give me a sore throat but I've never had that with these. good flavour the actually lasted longer than any cartomizers ive ever had! These cartomizers are great! I used to have similar a few years ago from a different company & then they changed the taste - but these are like the original ones I had so very happy! Easy to use, good battery life. Delivers a good strong taste and delivers a good "hit". Competitively priced. I strongly recommend. I'm so grateful I can still get them from this site as have trouble getting them anywhere else. Tried number of different E cigs however, these are fantastic for me as haven't smoked a real cigarette for over 3 years. The design is slimmer than other similar products currently on the market making it a more realistic cigarette alternative. The charging case is ideal for being away from the office for a full day as the slim design allows for a battery to be charging, spare cartomisers and a charged vapestick and easily fits in your pocket. Service and delivery is excellent as is the quality of the product. Have used these for years always liked them they've now changed the taste and they're disgusting, so are being sent back ! What more can I say !!! Prompt and efficient. Excellent service and delivery at a great price. Totally recommend. Battery is very poor and doesn't seem to last very long.